Our Texas certified real estate appraisers perform residential and commercial appraisal services throughout the Richmond area for both independent use and lender usage. We strive to provide an appraisal service that meets our clients’ needs and is delivered with an industry leading turn time. Our appraisal costs are highly competitive and we take pride in offering one of the fastest appraisal completion times in the area. We only employ appraisers that are local to the Houston area and familiar with its various markets. Our staff is capable of performing jobs for residential, commercial or mixed-use properties. If you have a commercial property that needs valuing our roster of Texas Certified General appraisers can provide you a quote based on the project details. Whether you need a home value report for lending, private use or a legal issues, our appraisal services can accommodate almost any real estate valuation use. Be it homeowners or industry professionals, our promise to you remains the same – to provide a competent and courteous appraisal service. Should you have any questions or you’re ready to place an order, simply call the phone number on this site or complete the appraisal order form found above. Getting scheduled takes minutes! 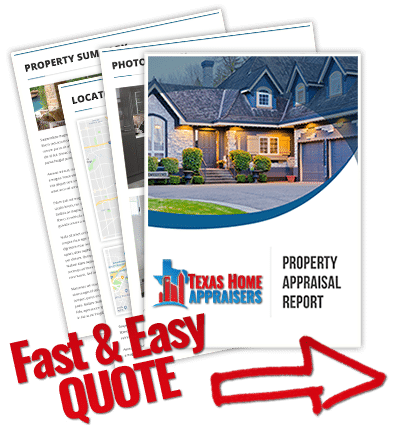 Simply use the online quote request form or ring the office and one of our certified houston property appraisers will be more than willing to help you with your assignment. Why do the appraiser’s measurements differ from the appraisal district? It depends. For the first example, let’s assume the Appraiser did their job and accurately measured the square footage and that the appraisal is correct. The Central Appraisal District (CAD) could be off due to a variety of reasons; such as the builder slightly deviated from blueprints, additional space was added without the city knowing, etc. For the second example, let’s assume that the CAD is correct: the appraisal would most likely be inaccurate due to improper rounding, using bad data, or only using estimates. Appraisers will not physically go on the roof but they will inspect it from the ground. If the appraiser notes anything that may influence value, positive or negative, they will include it within the report. If the appraiser finds that the roof may not be in acceptable condition, they will be required to note it within their report. What sources do appraisers use when researching data? The appraiser gets his or her information from a wide variety of sources, including the local Multiple Listing Service, local tax assessors records, local real estate professionals, county courthouse records, private public record data vendors, interviews with sellers and buyers, appraisal data co-operatives and his or her own personal knowledge or office files from previous appraisals. The quality and reliability of each piece of information is considered by the appraiser. The appraiser can also use data provided by a 3rd party so long as that data is directly applicable to appraisal, reliable and verifiable. How are home values impacted by flood zones? This depends on several factors including how much of the property is in a flood hazard, what FEMA designation the zone carries, and whether or not limited access or water damage could result from flooding. As an example, if just the back half of your property is located in a flood zone and there are no improvements to the area that could be damaged or cut-off by flooding, then it will have less impact on your value. Conversely, if half your home and parts of your driveway are in a FEMA flood zone then it will have a strong negative impact on your value. In either situation an appraiser must research other homes with similar flood hazards and determine the impact such a feature has on marketability.